A while back we asked this guy Theophilus London if he would be interested in doing a record with us. He kindly let us know that he’s already got a mixtape in the works and that his “representatives” would be in touch. Next thing we know, he’s having a party to celebrate the release of The Charming Mixtape, and we asked if we could be involved with that. So along with our good friends Mean Red and a host of others, we’re kicking off ‘09 in style. 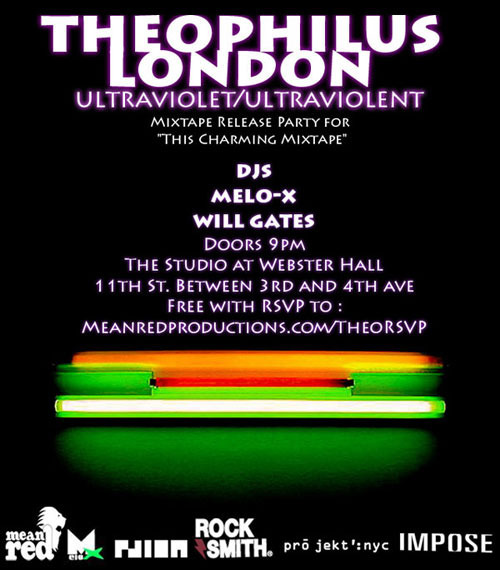 With a Free, Mixtape release party for Theophilus London this Wednesday at the Studio at Webster Hall. Did we mention it’s FREE?